We drove to Santa Barbara for some scheduled truck repairs, then visited Trader Joe’s. That is a destination must do stop on our list. Phil had never been to a Trader Joe’s and immediately adjusted well by filling our cart with all sorts of snacks. I am not quite sure what it is, but cheeses and crackers and assorted goodies just seem to taste better from Trader Joe’s. We took an alternate route home doing a little site-seeing through the Santa Ynez Mountains. We were directed to the Cold Springs Tavern for lunch. It was once a stage coach stop and it appears that some of the original (or well reproduced and aged) buildings are still intact. We walked the grounds and read the various history of the facility. There were numerous interesting tidbits about the rules for passengers, drivers and the acceptable behavior of gentlemen when ladies were present. The food was superb and reasonably priced. We stopped at the Cachuma Project, the Bradbury Dam holds back the overflow of the Santa Ynez river during the rainy season in the Cachuma lake. The water level is sadly low and a reminder of the 4 year severe drought that this region is suffering through. Everyone is hoping for rain this year. The weather was great on Sunday, so we took the kayak out to the Morro Bay area. It is a beautiful, coastal town and marina. We took a few few photos of the area with the cell phone from the kayak. It was an easy float out to the marina and an we oared around the bay. However, the trip back to the shore was far more strenuous. The wind had picked up and a current seemed to fight our attempts to progress forward. We still enjoyed just getting out on the water like the otter and basking in the sun like the sea lions for a couple of hours. We ate fresh seafood on the pier at the Little Fish Hut after the exercise. I hope that we get to do this again. I love this area of the California Coast! We spent a week in Park Sierra, a SKP Co-Op RV Park. It is a lovely park with a unique design and lay-out. Located near Coarsegold, California and less than 50 miles from Yosemite. It boasts that Teddy Roosevelt rode the stage coach through this land on his way to visit Paul Muir in Yosemite. Fortunately for us, Yosemite was declared a National Park after that visit. The Park lay-out is not the standard herringbone figure. The lots are somewhat secluded into crooks and crannies along curvy and hilly streets. We had a beautiful site on a hill and watched the quail parade in and out of our patio area. Annual member meeting parking lot full of golf carts. A good turnout of membership. It was the Annual Membership Meeting week. We were invited to observed their meetings and to enjoy the meals and visit with the voting members. It was impressively enjoyable and they handle their business meetings professionally and with enthusiasm. We like this park and will return. We decided to work our way south visiting the National Parks on the way. The weather is getting cooler in the northwest, but it is still very warm in California. We left Sutherlin with some confidence in the solar and headed through Roseburg on our way to Diamond Lake with plans to day trip it to Crater Lake. We had no idea of the tragedy that took place in Roseburg at the college for several days. We were shocked and dismayed once we learned of it. As fledgling full-timing Rvers, we are constantly learning different ways of doing things to make life easier and more comfortable while we travel. We spent a couple of weeks in Sequim, Washington at the Elk’s Lodge, while I recovered from a dancing toe injury: We were two-stepping at the local Elks Lodge when I managed to get my new pedicured foot under Phil’s cowboy boot. 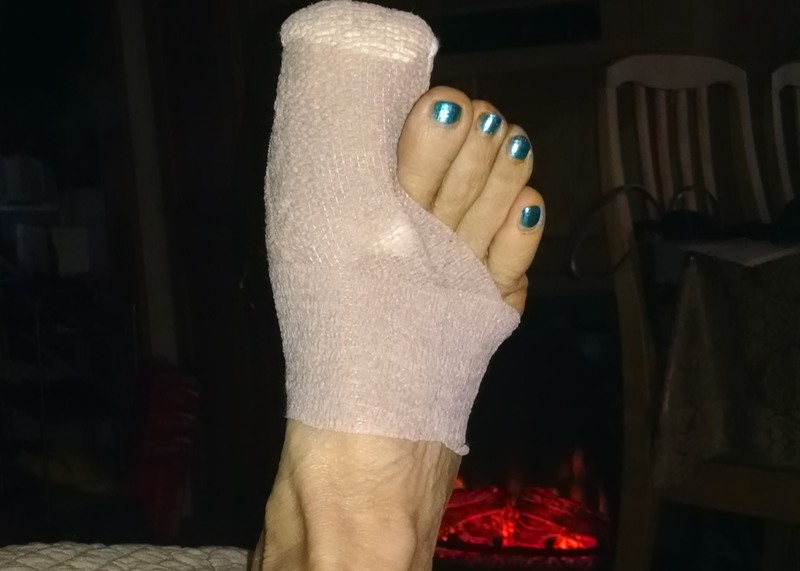 We actually had to leave the hall and head to the ER about 17 miles away in Port Townsend where they were able to surgically remove the big toe nail. It looked awful for a week or so, but I am fine now. Thanks to the good care by Phil. He was very attentive and kept the ice bag ready 20 minutes every hour. While I recovered with ice and a raised foot in the recliner, rented movies and several novels, Phil tidied up the incoming water connection system that we use. He was not pleased with our messy system where the filter flip-flopped on the ground and hoses were scattered. We had used a bucket system for a while but it didn’t have the stability that this system gives. 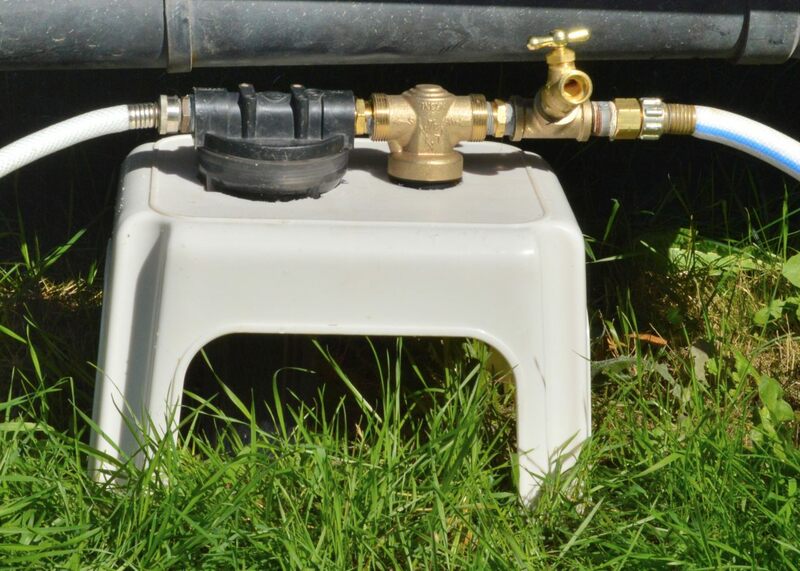 Using a plastic inexpensive footstool, he drilled or cut holes to fit our filter and a pressure gauge. The footstool gives a stability to the heavy items and keeps them off the ground. He also was able to install the two valve faucet allowing him to add a hose for various options. A neighboring RVer had built this system for his RV and we promptly borrowed his idea. He didn’t mind. RVers are like that, they share good ideas! The other project was returning a blue flame propane heater to AMAZON as we could not get it to stop leaking propane. It was a small leak, but the odor was offensive to me and of course any propane leak is very dangerous. We ordered another type of propane heater, this one is smaller and so far it appears to be leak free. 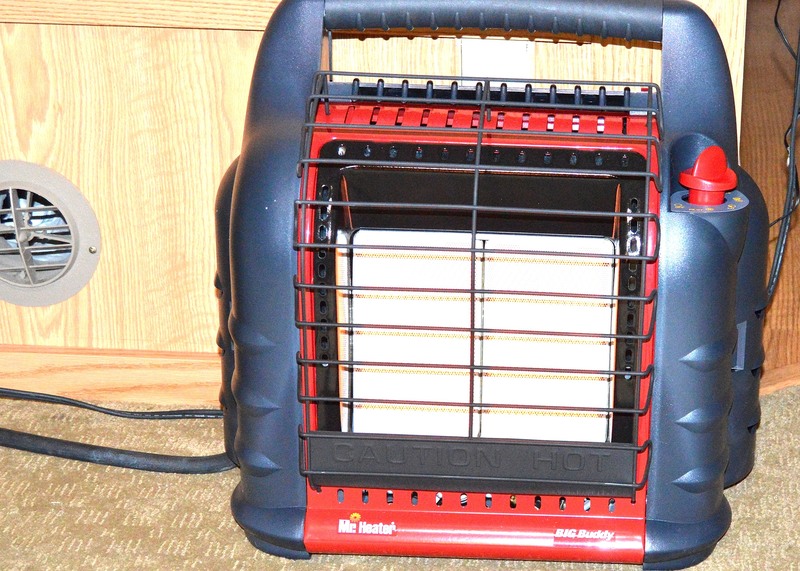 It is a Mr. Heater Big Buddy 19000 BTU, radiant heater and I do like the way this type of heat feels like rays of Sun. We do not sleep with it on and we still keep a window cracked to be sure there is plenty of fresh air available. We also updated our propane leak detector system as ours was over 10 years old. I think the rule of thumb is 5 years to replace them. 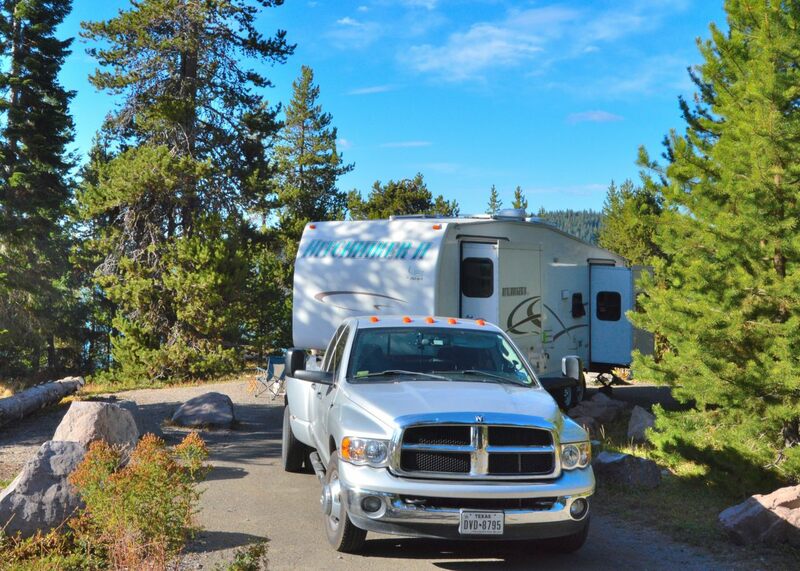 We like camping in National Parks and Forests from time to time and it seems that the prettiest sites are often boon docking or dry camp sites. The mornings and evenings can get chilly this time of year in the northwest. It is just starting its’ stormy, rainy season and temperatures are cooling down. The recent rains are much needed in this area and we have enjoyed the raindrops falling on the roof. So far, they have been gentle and the winds mild. While we were still in Sequim at the Elk’s Lodge, they were having a dinner. The lodge provided the meat. Guess what the meat was. Our next stop will be in Oregon to add one more AGM battery and one more solar panel. The extra battery will bring the 200 Amp Hours to 300 Amp hours and the new solar panel will up our Wattage from 160 to 320 to charge the batteries. That should complete our off-grid solar system install that we started last March. Phil cut open a spot between the two AGM batteries installed not long ago, re-cabling the batteries and replacing the solar wiring with heavier wire to add efficiency to the system’s charging capabilities. It is a small solar system comparatively, but we feel it will meet our limited needs. We don’t camp off grid a lot but when we do, we want to be comfortable. We will let you know how it works!